What are the goals of permaculture design? What are we trying to do? The goal of any design is to provide a solution to a problem. The problem permaculture addresses is the maximization of human welfare achieved in a sustainable way. To put it another way, we are trying to ensure long-term survival in a way that does not make us all miserable. When the term “sustainable” is used, we are really talking about energy budgeting. In a closed system like the Earth (or even in our finite galaxy) there is a maximum amount of energy available. To be able to survive long term means not spending more than you save. A designed human environment is sustainable if, over its lifetime, it captures more energy than was required for its manufacture, implementation and maintenance and provides a surplus for human use. Considering the current industrial model for food production, in which one calorie of food energy is created at the expense of 10 calories of input energy, this definition shows us that our food systems are not sustainable. Similar accounting for other human activities shows that sustainable activity is actually the exception these days. With the problem defined, we can work out a solution. Keeping sustainability in mind, we can set a guideline for design: Design action around energy, not the other way around. A given bioregion has a limit to how much energy it can capture and store for our activities. To go beyond this limit is to push the costs of those activities off onto others and future generations. We are not interested in a sociopathic approach to design, so we want to avoid doing this outcome. 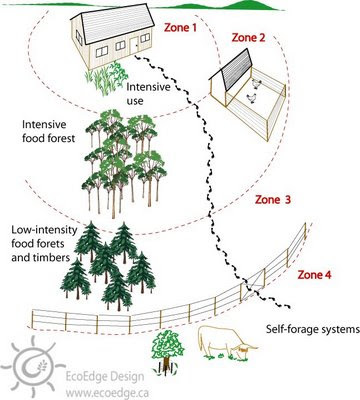 One way to design around energy is through the permaculture technique of setting up zones for activities. Activities that require regular, daily attention should be located in a place close to where the people are. While I am always pleased to see people producing their own food in gardens, those gardens are unfortunately usually located at the farthest point in the backyard from the backdoor. Incentive to trudge all the way out there is reduced by its relative distance and it requires more human energy to get out there. How likely are you to go out to the garden to pick fresh herbs for your breakfast if it’s raining and the garden is 10 metres or more from the door? Not very likely. As the attention required by the elements in the design decreases, their distance from the most trafficked areas increases. Animals, if they are incorporated into the design, are a little farther out, perhaps with fruiting perennials. Nut and timber trees are farther out still. With elements placed geographically according to frequency of use, the energy required to tend to them is minimized. To maximize energy efficiency, we can also mimic nature. Living and nonliving elements in ecosystems are interconnected, so should the elements in our design be. While the approach of compartmentalizing each element makes for simplicity in the minds of men, it is unnatural and creates more work than is necessary. One could set up an area for one set of crops, then another set of crops, another for trees, another for poultry, and so on. It looks simple – everything in its place. But to do this is to simultaneously ignore beneficial interactions between elements and to create more work for ourselves. If crops such as onions and others from the lily family are planted with apple trees, for example, they would provide a non-competing groundcover (unlike grasses) and flowers to attract pollinators and a host of other beneficial insects that show up with them. Compartmentalized, however, this mutually beneficial arrangement is lost. Poultry let into the garden in a controlled manner provide pest control, weeding and fertilization with minimal losses of garden vegetables. Poultry under perennial fruits clean up fallen fruit, breaking pest cycles. Separated and compartmentalized, these elements cannot mutually interact and start to generate waste. This means more work is left up to the people on site. We can match up these elements by noting their characteristics and matching them with other needs. Chickens love scratching, for example. Pigs love rooting. If you have either animal, why damage soil life by cultivating the ground with an expensive and unsustainable machine in preparation for a garden when you can pen these animals in to the future garden site to do a better job without hurting the soil life and fertilize the soil at the same time? We can also make note of harmful interactions as well. For example, some plants, like sunflowers, are allelopathic, meaning they put out a chemical that suppresses the growth of most other plants. While they might not make a beneficial companion for your other plants, they could be used as living barriers to prevent the spread of plants you are growing but don’t want to invade other parts of the garden. Ignoring this use of the characteristics of allelopathic plants means that the gardener must now expend energy to put in some sort of artificial barrier – one that has its own embodied energy cost. Inorganic elements on site are also a consideration. A sun-facing rock will store heat, for instance, making it sometimes possible to grow plants in the microclimate around it that would otherwise not survive or thrive in that climate. Returning to the goal of permaculture design – creating sustainable environments to meet human needs – we need to look at just what human needs are. Fortunately, we are the most studied species on the planet. There is plenty of information available on the physiological, social and psychological needs of the species to make a very detailed set of species characteristics. Furthermore, the area of happiness has also been studied showing us what makes us genuinely happy and what does not. Our physiological needs include clean food, clean water, clean air, warmth, and shelter. The physiological does not stand alone, however. The social and psychological are also a part of the requirements for physical health, though they themselves are intangible. 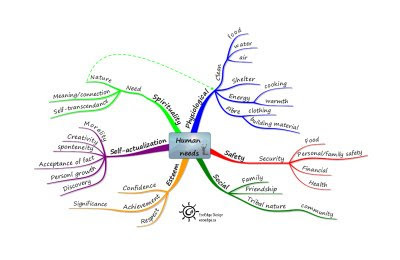 Maslow’s hierarchy of needs is a pretty good model for determining human needs, and the diagram below is patterned in large part, though not exclusively, from it. I’ve put together some of the needs that I’ve seen have empirical evidence to back them and avoided the influence of spiritual, political or economic ideology as best as I could. For simplicity’s sake, the needs here are not meant to be an exhaustive list of human needs, just a sampling of important needs. Next, we can ask what the aim of the current status quo system is. Is the aim of our society long term sustainability/survivability? Not by any stretch of the imagination. We are living well beyond our needs with the dream that some wondrous technology will come and solve this problem for us. There is no better recipe for collapse of civilization than that. Is the aim of our society personal or community happiness? Again, no. We have data consistently showing that while personal wealth has, on the whole, increased, happiness has decreased. Communities, too, are becoming less integrated and interdependent than they once were. This is not a good outcome for a tribal species. Is the aim to maximize human potential? No. The concern of our society is not to get as many people as possible to experience the maximum personal growth possible. National funding on mental health is enough to indicate that this is not a serious aim. Is the aim simply to meet material needs for clean, healthy food, clean water, clean air, shelter and energy for warmth and cooking? The food we eat holds less nutritional value now that we’ve industrialized food production. Furthermore, biocide use contaminates not only the food, but more importantly and more severely the farmers and environment that produced it. There is no clean air unpolluted by man-made chemicals anywhere on Earth. There is no clean, uncontaminated water left, save for what is available in glaciers. Shelter is available, to some at least. Looking at homeless populations, it appears that over-priced shelter is available, provided you are both mentally fit and gainfully employed or with sufficient financial reserves to provide you with a roof over your head. And energy to stay warm and cook food? The same conditions seem to apply as for shelter. So, no, this is not the aim of the current system. If it were a serious concern, it would meet these needs better, assuming we are not all outlandishly incompetent. Knowing this, we can ask how well the current system works at delivering our identified human needs. Well, some are met, others are not; and those that are met are almost never done in a sustainable way. Our physical needs are not fully met and to the extent they are, the process of meeting them is eroding our capacity for survival in the long term. Our social needs are not met. The consumption of ever more gadgets is not strengthening families or communities, nor is it cementing real friendships. Too many home buyers are looking to move into a good marketplace as opposed to a good community – one with real bonds between people. Connection to a geological site is not an important factor anymore with many or perhaps most people. Our needs for connection and spiritual and personal growth are not met. In fact, you can go through the needs in the diagram point by point and find that the current system does a poor job of delivering them and completely overlooks some needs altogether. So there exists a gap between what the system can deliver and what humans need. Filling in this gap is the task of design: identifying the needs and meeting them sustainably in the most efficient way. Interestingly, the people who are doing this now and living in these designed systems are usually reporting increased happiness as well (happiness that can’t all be solely attributed to Mycobacterium vaccae, the soil bacteria that has been found to boost mood when in contact with human skin). And why wouldn’t they be happy? Their physical needs are getting met. They require less time to acquire food when compared with the need to work for money to then walk or drive to a market to pick out food to then carry home and unpack and load into the refrigerator. They require less energy and money to stay warm or cool in their homes. Their homes are designed around function and not architectural fashion. They are usually folks who are involved with establishing connections in their community. So, many of their intangible human needs are addressed by their systems. That said, the work we are doing is not reweaving the threads of the tapestry of society. We are just tying up the first lengthwise wrap threads of the tapestry to be woven in the future. We have yet to find all the answers, and the real work is ahead of us. But the choice is sustainability/survival or adherence to a system that we know doesn’t meet our needs. Which path to take seems clear enough.